Ice Arena is the first multifunctional building where competitors of various winter disciplines can train: speed skating, figure skating, hockey and short track. We hope that skaters of these four disciplines will feel in Ice Arena like at home. This investment was promoted by the President of Tomaszów Mazowiecki (Marcin Witko) and Ministry of Sport and Tourism (Witold Bańka). The main contractor of this project was the construction company from Radom (Rosa-Bud). Ice Arena has total capacity of 292,000 m3. 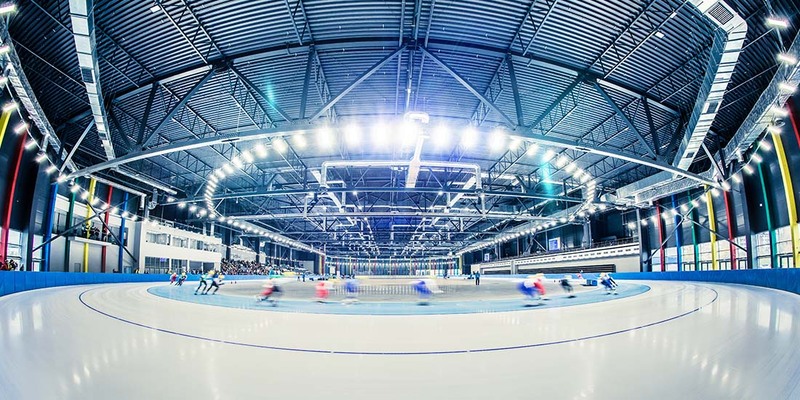 There is full-sized ice rink for speed skating which length is 400 m, ice hockey rink, figure skating rink and oval ice track. It is one of the biggest building of this kind in Poland which has four zones of ice freezing, modern audio and lighting system to transmission HD. There are also folding facilities: volleyball courts (18x9m), handball fields (20x40m), basketball courts (28x15m), tennis courts, tartan running track and stand (both folding and static) which has a capacity of 3-10,000 spectators. Competitors can warm up in the room for general preparations. For people who prefer other forms of entertainment there is special zone to organise exhibitions, vernissages and concerts. Furthermore, Ice Arena offers fully furnished conference rooms. Ice Arena is adopted for needs of professional competitors, however, inhabitants of our town and guests, who come by to spend their free time in an active way, are also essential for us. What does the world say about ISU World Cup in Tomaszów Mazowiecki?